In a nonstick fry pan place the cut mango pieces or ripe mangoes , turmeric powder,red chilly powder, curry leaves and salt. 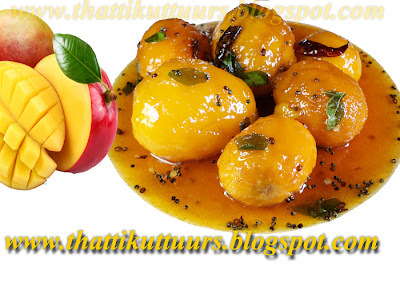 Add enough water to cover the ingredients and cook till mango/ Mango pieces are well cooked and turn soft. Grind grated coconut, green chillies,cumin seeds,curry leaves to a fine paste adding half of the yogurt. Add this paste to the cooked mangoes,add salt and mix well; allow it to boil on a low heat(Simmer it) and keep stirring continuously. Whip the remaining yogurt/curd and add to the curry and mix well; Bring to a boil and cook for a minute.Keep stirring till the gravy is heated through,(don’t allow yogurt to curdle) now add sugar;Remove from the heat and keep it aside. In a small frying pan, heat coconut oil and add the mustard seeds. When it start to splutter,add curry leaves and red chilies; Pour this over the prepared Pulissery/Mango-yogurt gravy and mix well.